In 1915, Laura visited San Francisco. She came to spend some time with her daughter Rose who was a reporter for The Bulletin, a local paper at the time. 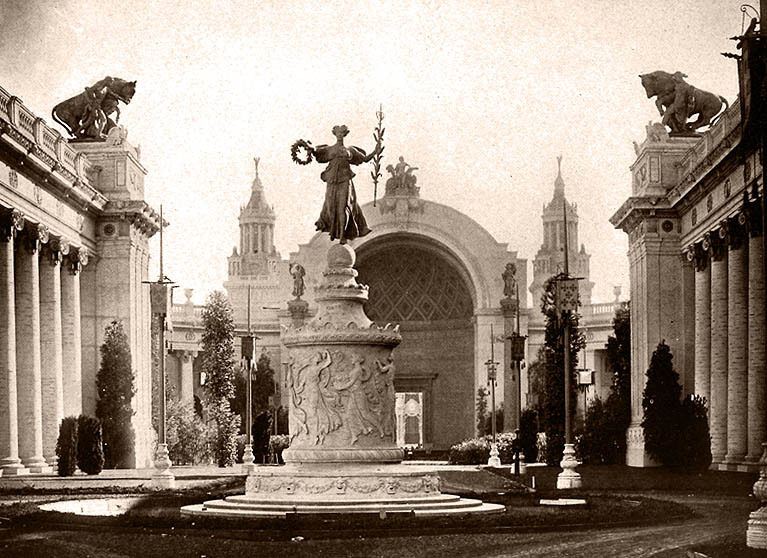 While in the city, she also attended the Panama Pacific International Exposition several times. In 1974, the many descriptive letters that she wrote to her husband during this trip were compiled and published in a book called West From Home. This book gives a wonderful insight into some of the day-to-day details of life in 1915 San Francisco, and describes some of what she saw when attending the PPIE. Here are some images from 1915 fair viewbooks, along with a few of the words that Laura used when describing these attractions. (Click on photos to see larger image.) I will try to add more pictures/excerpts as time allows. "The buildings are built like those of a city and the streets and the four corners of streets form the courts. One goes through beautiful archways in the buildings into the courts where fountains splash and lovely flowers and green things are growing. there are life-like statues and figures of animals and birds. The foundation color of the buildings is a soft gray and as it rises it is changed to the soft yellows picked out in places by blue and red and green and the eye is carried up and up by the architecture, spires and things, to the beautiful blue sky above. I have never imagined anything so beautiful." 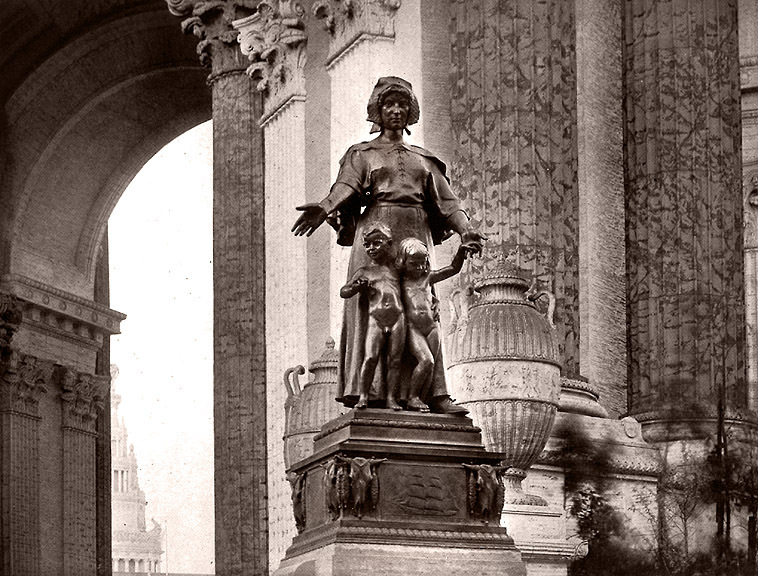 "'The Pioneer Mother' is [one of the wonderful statues] -- a life-size group up on a pedestal so one looks up to it. A woman in a sunbonnet, of course pushed back to show her face, with her sleeves pushed up, guiding a boy and girl before her and sheltering and protecting them with her arms and pointing the way westward. It is wonderful and so true in detail. The shoe exposed is large and heavy and I'd swear it had been half-soled." "Just here Rose called to come quick and go see the fireworks at the Fair. We put on our heavy coats and went out to the walk before the house and just a little way along it and sat down on a stone curb. The white Tower of Jewels is in sight from there. The jewels strung around it glitter and shine in beautiful colors. The jewels are from austria and cost ninety cents each and they decorate all the cornices on the high, fancifully built tower. 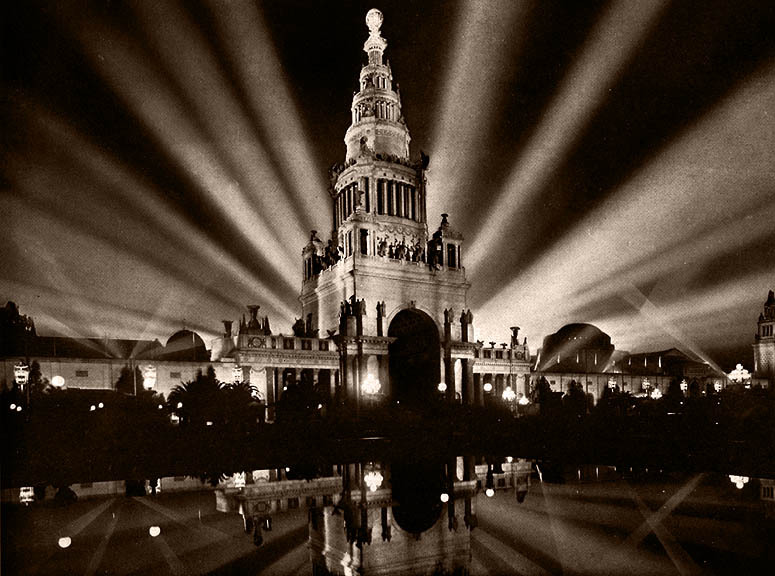 A searchlight is directed on the tower at night to show it off and it is wonderful." 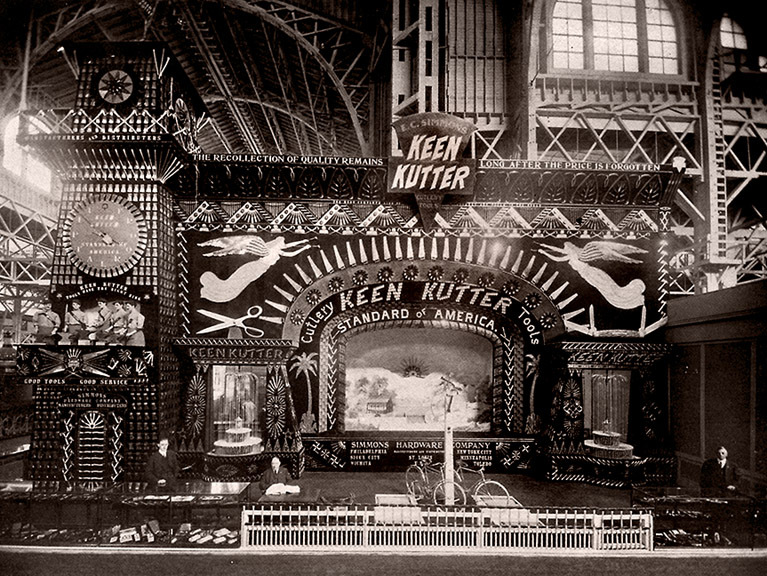 "We went to the Manufacturers' Building... and saw the "Keen Kutter" exhibit. In the center of the space, which was nearly two hundred feet square... Everything about the exhibit was worked by electricity. Above... is an arch made of glistening spoons of different sizes. At the upper right-hand corner was a gigantic pocket knife with four blades that kept opening and shutting and at the upper left-hand corner was a row of seven blacksmiths standing each at his anvil with a different tool in his hand. At stated times first one and then another would beat the tool on the anvil with his hammer... At the center top were two windmills made of ax blades continually turning. It was very interesting." 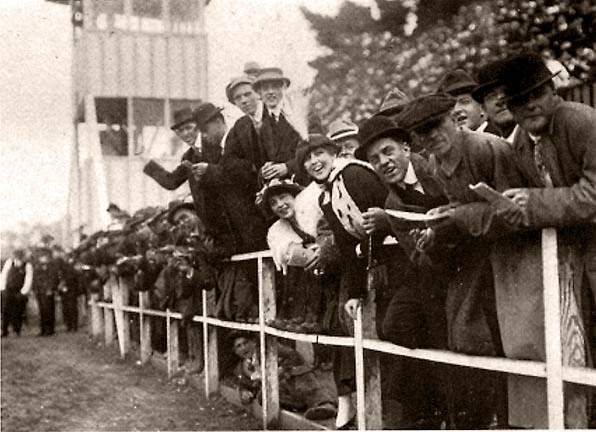 "We went through a large entrance gate and were in the Zone, which is a long street of attractions like the side shows at a circus, only of course not to be compared with them as they are simply wonderful. We took a seat on one of the little trains drawn by a motor and rode the length of the Zone, for it is so far and there is so much walking to do." "We went to... the Zone and went to the Samoan village. Samoa, you know, are South Sea islands belonging to the U.S. 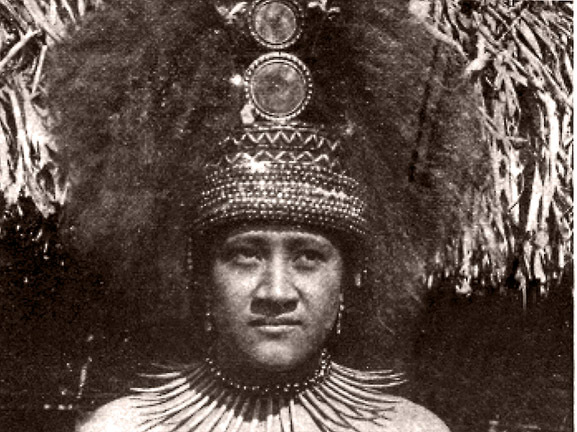 There were several girls and men dressed, or rather undressed, in their native costume... They wore necklaces and strings of beads and rings... Their skin was a beautiful golden color where it was not tattooed and their voices were soft and musical. The girls are very pretty and some of the men are fine-looking. They danced their native dances and sang their island songs. In all this dancing and singing they never touched each other and they danced in every muscle of their bodies, even their fingers and toes... I did enjoy every bit of it." "There were some lovely Kentucky race and riding horses, and believe me, they can all have their automobiles that want them. I would have me a Kentucky riding horse if I could afford it." "As we looked, the aeroscope rose above the tops of the buildings. It is a car that can hold five hundred people. Its outlines are marked by electric lights. It is on the top of a more slender part and is lowered for the people to fill the car, then is raised high so they can look down on the whole Exposition at once. They have that instead of the Ferris Wheel. As it rises, it looks like some giant with a square head, craning his long neck up and up. I don't suppose it looks like that to anyone else, but that is the way it makes me feel."